Sometimes, just sometimes everything lines up for a magical session: the skies are clear and the temperature just right, the locals are asleep or too grumpy (yet), the light is perfect and your couple is just cuteness overload. This is how I recall their session. Ksu and Vlad are not camera shy at all, they even included a photo of themselves in their original email to us which is rare, but lovely at the same time because you can put a face to the name immediately from the start of the messaging. 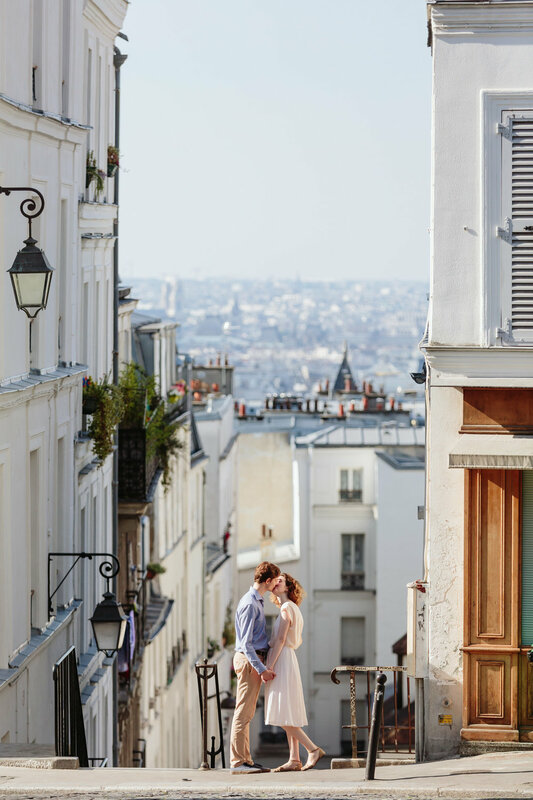 The guys were looking for a cute morning session and we set up a route that took us from Trocadéro to Saint Germain to the hilltop of Montmartre. The guys indulged me in trying out a few new different angles and views... which turned out amazing. I really cannot wait for the roses to bloom in the garden's gate, I cannot wait for the warm weather to come back, I cannot hope more for more couples like these two lovebirds.